​To upload files using our FTP, please login below. All files should either have all fonts converted to outlines or should be sent with an additional font folder. For InDesign files, fonts and links should be packaged in a folder with the design along with the PDF files. Vector artwork is created by points and paths that are easily editable and can be manipulated to satisfy your banner requests. Vector files are typically created in Illustrator and saved as .AI, .EPS, or .PDF. Raster artwork is made up of many pixels resulting in an image that is NOT editable (cannot be manipulated in any way.) Raster images are typically saved as .jpg, .bmp, .psd, .tif, or .pcx. Raster artwork cannot be converted, in any way, to a vector image. If you choose to use raster artwork, be aware that it will result in a low quality, highly pixilated image when scaled to accommodate the banner size. If you are unable to supply vector artwork and only have a raster image, our designers are available to work with you to find the best solution. An additional design charge will be imposed if the image needs to be recreated as a vector file. Upload to our FTP site. Please call a representative to receive a username and password. 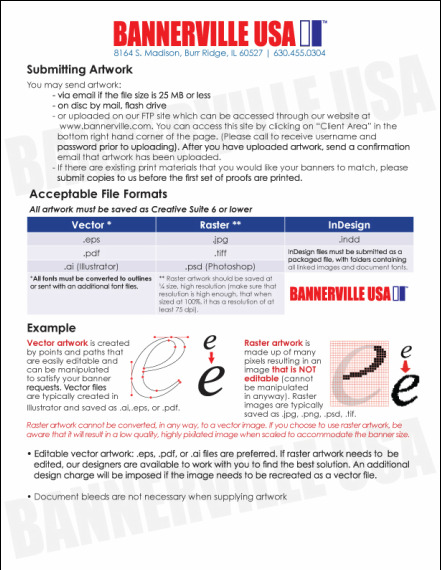 ​Please read our Banner Submission Specifications PDF file on how to set up a file for light pole banners. Raster artwork should be saved at 1/4 size, high resolution (make sure that resolution is high enough, that when sized at 100%, it has a resolution of at least 75 dpi). Our professional banner designers can provide you with layouts and finished artwork through email, but note that color proofing via email is not recommended. Please call to determine production and shipment time.